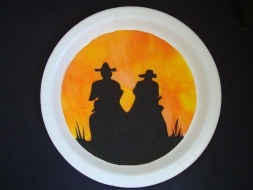 This Sunset Cowboys picture is a wonderful Cowboy or Western craft for Preschoolers on up. It's also be an easy and inexpensive craft for a Cowboy or Western theme birthday party! 1. Place your coffee filter onto a piece of wax paper or paper bag. Fill 2 containers with 2 Tablespoons of water each, mix 10 drops of yellow food coloring in one container and 10 drops of red food coloring in the other (this amount can make 2-3 "sunsets"). 2. Spread your coffee filter out and drop some yellow and then some red all over your coffee filter. When the yellow and red run into each other it will create a beautiful orange. Place your coffee filter outside in the sun, or in a sunny window to dry. Coffee filters usually don't take long to dry, but it depends on your climate. If you are doing this craft in the summer and it's warm out it should only take 5-10 minutes for it to completely dry. 3. Cut out your cowboys from the template (an adult will have to do this part for the younger ones). Once your coffee filter is dry glue your cowboys onto your sunset. The edges will hang over the coffee filter, so trim off the excess. 4. Glue your picture into a paper plate to frame it. If you want to hang it just punch two holes on either side of the plate and tie on some string. Food coloring can stain clothes, so make sure the kids have a smock on. To make this a little less messy you can have the kids color their coffee filter with red and yellow washable markers. Use a spray bottle to mist it a couple of times and let dry. The colors will mix together. You'll notice the cowboy template has some small blades of grass on either side. This can be a little difficult for smaller children to try and cut, so you can always just cut them off entirely. *We used a 10¾ inch paper plate, it frames a standard coffee filter (8 inch) very well.